"I wanted to do something on the other end of the spectrum": Ken Garing talks 'Gogor' – AiPT! Ken Garing is no stranger to crafting one-of-a-kind sci-fi worlds. BothÂ Planetoid and Planetoid Praxis were highly entertaining, exploring otherworldly destinations packed with kooky aliens and engaging culture. Now, it’s time for Garing to return to Image Comics and do it all over again. 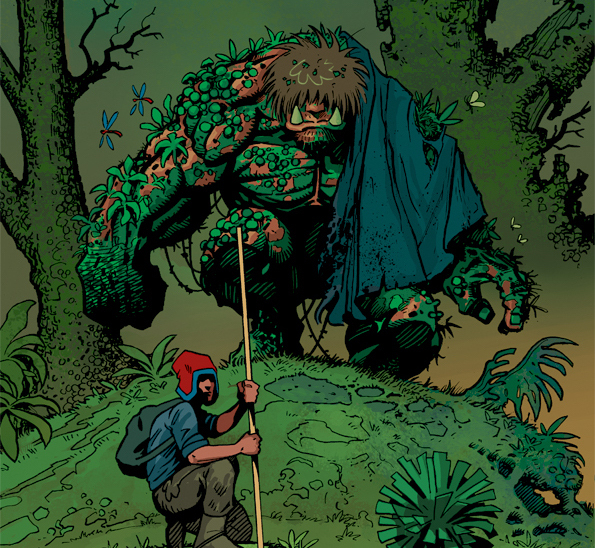 In his new series Gogor (out May 1), Garing will unveil a brand-new world that’s rife with vibrant, effervescent jungles (as opposed to the rusty metal world of Planetoid). Given his ability to develop an entire world from scratch, there’s certainly enough evidence for having the highest of hopes. We recently touched base with Garing to talk Gogor as well as the comic book craft. This wasn’t our first conversation, and I hope it’s not the last. He’s a unique artist/writer who creates landscapes that are as bizarre and unfamiliar as they are somehow inviting, places culled from some shared dreamspace. And if that weren’t enough, check out two exclusive images from Gogor. AiPT! : Hi Ken, thanks for taking the time to answer a few questions. It has been a little over a year and a half since Planetoid Praxis, your last comic with Image Comics. What have you been up to (I know last time we talked you said you were trying to get away from screens!)? Ken Garing: I’ve done a few covers and commissions here and there, and I did some work for my friend on a virtual reality painting program called VR Paint. But mostly I’ve been working on Gogor. Whenever I start a new series, the first issue always takes many months to finish. There’s always a lot of revisions. But it’s going really well now that I know what I’m doing. I still want to get away from using the computer for coloring and lettering. I’ve dabbled in doing some fantasy painting in acrylic since I’ve been on a Simon Bisley kick recently. But I haven’t incorporated it into my interior pages. I want to though. Also, I don’t talk about it much, but the Planetoid film/TV option has changed hands and is moving forward. No announcement yet, but I’ve been involved in the development on that as well. AiPT! : There’s a lot of color in the preview pages for Gogor. Are you actively trying to use more color in this series compared to the more mechanical and rusty Planetoid series? KG: Yes. I did nearly 350 pages on Planetoid, probably more than that if you include all the revisions. So, that’s a lot of rotting metal to draw and color. And Planetoid has a somewhat serious and austere tone, so I wanted to do something on the other end of the spectrum. Also, I’ve noticed in comics (movies and video games, too) a lot of grey muddy colors everywhere. Even in fantasy and superhero comics and I’m starting to really hate it. So with Gogor, I wanted to work with simple, clear colors and shapes. I think Wacom tablets are also making artists zoom in too much. A lot of figure work looks kinda stiff and weak these days. I still use pen and ink, so I’m trying to beef my line work. Again, clarity of shape and direction are a focal point for me on this project. AiPT! : Any chance the world in Gogor is connected to or in the same universe as Planetoid? KG:Â Not formally, but there might be some overlap. In Planetoid, there’s an alien race called the Ebotak and they might show up in Gogor. They seem like they would fit. AiPT! : What sort of challenges are you undertaking with this latest project? KG:Â In terms of world-building, it’s even bigger than Planetoid. So, in order to keep it from becoming unwieldy, my approach is to flesh things out within the action. For example, Gogor #1 opens with a chase scene, and within that action, I can introduce the main character and the physical landscape and even establish some themes. I’m trying to make the issues dense with storytelling while making them seem light and airy. Aside from that, the biggest challenge is the pure labor involved. I’m getting better at managing it but still, it’s a lot of work for one person. AiPT! : You’re in an elevator with the #1 director who would produce the Gogor movie. Who is the director and what is your 30-second pitch? KG:Â I’m not good at that sort of thing! It makes sense for a 90-page screenplay, but if someone wants to develop one of my comics for film/TV, I think the comic itself is the best pitch anyone could ask for. It’s all right there and the person can just flip through it. As far as directors, Jim Henson is the name that first comes to mind but he’s no longer with us, of course. I should say, that his work was a big part of the inspiration for Gogor. AiPT! : Based on how rich the world of Planetoid was, I’ll definitely be picking this up. How long is this series planned? KG:Â It’s announced as an ongoing series. The first arc is complete and I’m working on the second. Basically, if I can get into the double digits I’ll consider that a major victory. So, 10-12 issues in all, with the possibility of returning to do more in the future. Gogor will be out in comic shops on May 1, 2019. You can also pre-order a copy today.